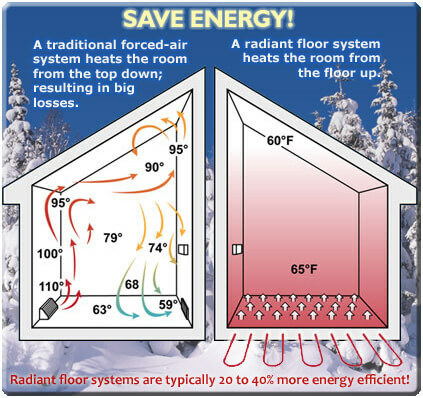 Radiant heating is an energy-efficient system that radiates warm, even heat. 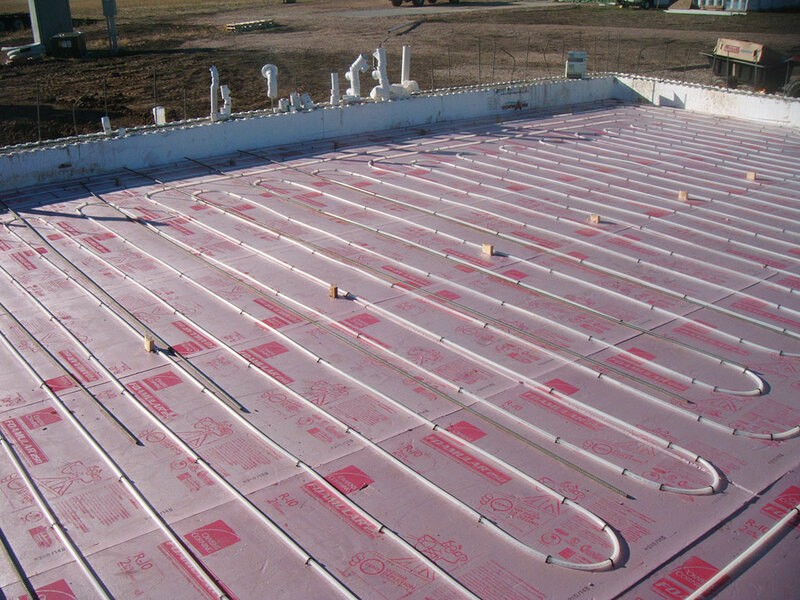 The system works by circulating warm water through a network of cross-linked polyethylene pipes placed in the floor. Energy efficient, it works with a variety of heat sources and floor coverings. Therefore, home owners who chose to install such a system are not tied to ever rising costs of oil and gas, but instead can consider alternative and green energy sources such as solar and heat pumps, or wood fired boilers. A heat pump is a mechanism that is used to extract heat from a source with lower temperature and transfer it into a source with a higher temperature. A heat pump can also be used for cooling, however, only the heating option is needed in radiant heating systems. While air-source heat pumps are very common, geothermal heat pumps are considered to be more efficient for a radiant heating system. The difference between the two pumps is that instead of using outside air, a geothermal heat pump absorbs heat from the earth. A geothermal system consists of a circuit of polyethylene tubes that are laid underground. A mix of water and refrigerant is then used as a method of heat transfer. The heat pump cools down the liquid that is flowing underground to the degree that is below the earth temperature. Once underground, heat from earth is absorbed unto the liquid, and the heat is extracted once the water reaches the heat pump on its way back. This is a closed loop system, therefore once heat is extracted, the water is cooled again and the cycle is repeated for as long as the heat pump remains turned on. The size of the piping loop should be correlated to the size of the property that needs to be heated. Depending on various factors, such as property size or soil texture, the loops can be either horizontal or vertical. In horizontal installation, 4 to 7 feet trenches are dug and pipe is laid down. In vertical loop installation, which is more costly, a 100 to 500 feet hole is drilled and piping is inserted into it. The advantage of such a system is that underground temperature is relatively constant and warm, unlike the outside temperature which fluctuates from hot to cold. Most households that use heat pumps also have a backup heater or a boiler in place to be used if a need arises. A geothermal heat pump is expensive to install, due to the cost of the pump itself as well costs involved with laying pipes underground. However, at current energy prices, the savings may pay for the pumps within just 5 to 7 years. Additionally, due to the government's push for green technology and renewable energy, legislation has been passed that allows for a 30 percent tax credit for geothermal pump that are installed between 2009 to 2016. Since tax credit laws may change year to year, it is advised to check the current available credit prior to installation of the system. Most of the energy used by the heat pump is renewable and doesn't produce any pollution, making it attractive to environmentally conscious consumers as well as those who wish to reduce their energy bill. It is recommended that a professional contractor be hired and the installation should be done according to the International Ground Source Heat Pump Association (IGSHPA) guidelines. Geothermal heat pumps may be effective when used for a radiant heating system to heat a house; the heat pump supplies hot water, while PEX tubing transports it to heat the floors. Both systems use green technology, while delivering comfort and savings to the home owner.